This was a huge checkmark on the Cinnamon Bun to-do list, and the next big project after the invites went out. Our jam favours were one of the first things I blogged about, and then I got the Silhouette machine and blogged about the labels. I changed one of the fonts out since my last post about the labels – the combination is now American Typewriter (like before) and Jellyka Saint Andrew’s Queen (the same as the addresses on our envelopes). 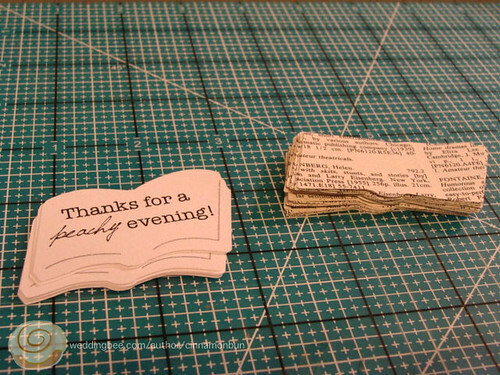 Cut out 70+ labels in the book page shape, then cut out 70+ book covers from the giant theatre text that I’ve barely put a dent in with all my projects. 24 Thank you berry much! 12 Thanks for a peachy evening! 12 Thanks for being so sweet! 12 Thanks for jammin’ with us! 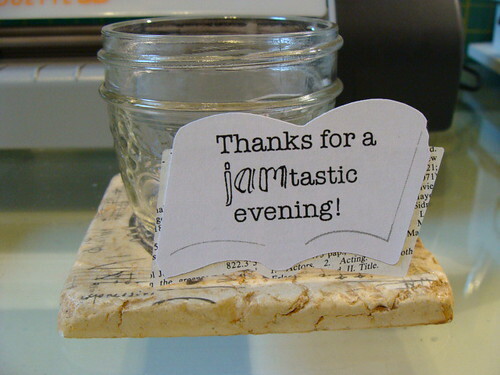 12 Thanks for a jam-tastic evening! 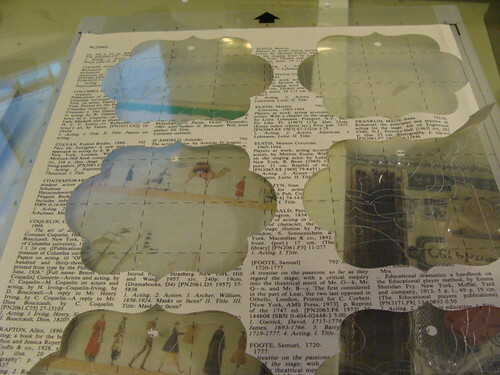 Once they were all dry, I used a 1/4″ hole punch to punch a hole in the top left corner of each label, and strung some black-and-white bakers’ twine through the hole. I asked Cinnamon Buns to cut the twine, and he came back 1 minute later with more than 70 bits just the right length. He did it so fast by finding a book the right size, wrapping the twine around it, and then cutting through all the wraps at once. He’s a smartypants. I was going to cut them one by one! 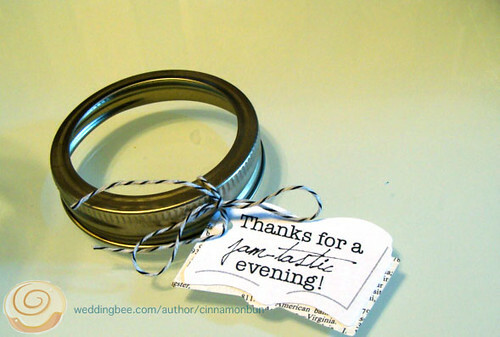 Those got tied to the ring part of the jar lid with a nice little bow. 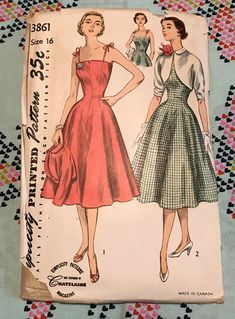 I cut a 5.75″ circle out of cardboard and traced it on to my folded fabric 6 times – as it was folded double, cutting 6 circles out with my pinking shears gave me 12 circles. I just used my trusty orange Sharpie on the wrong side of the fabric, and made sure to cut right on the orange line. I had to use a black pen for the peach fabric though! And here are each of the flavours of favours! Hm, I seem to have forgotten to photograph the blackberry, but I swear they’re done! 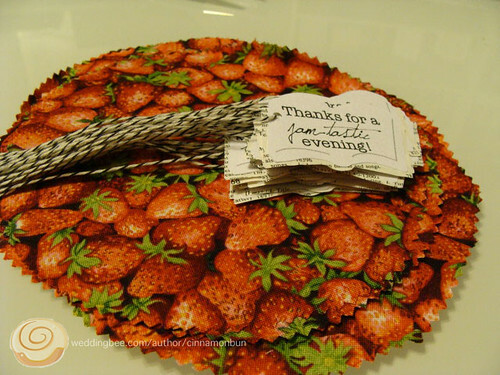 The strawberry only exist right now as the fabric circles and extra labels you saw above – that jam will arrive in June when my parents drive out for the wedding. We wanted to use in-season fruit, and as we made this decision in July, it was in time for everything but the strawberries. 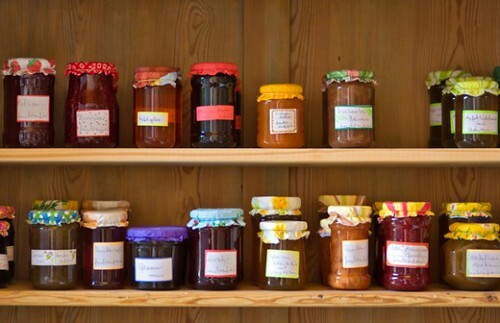 Each jam has a selection of different labels, except for the peach. 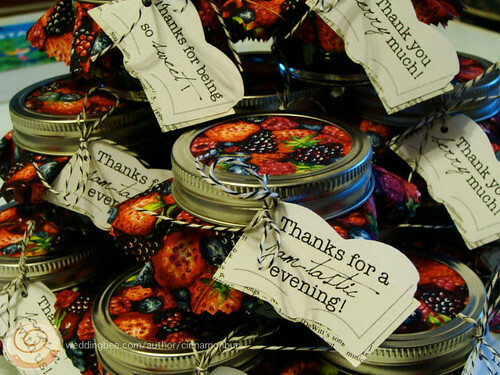 I obviously couldn’t use any berry puns for the peach jam, and I just liked ‘Thanks for a peachy evening’ so much. 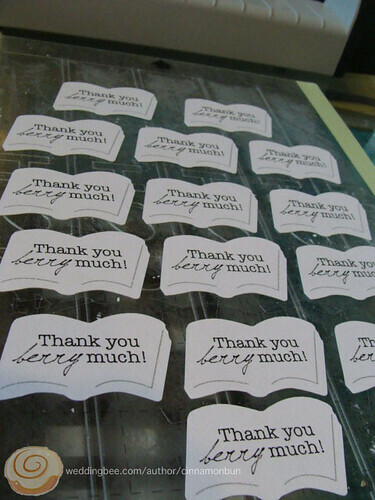 I did double the amount of ‘Thank you berry much!’ because it was one of the most obvious ones, and a good groaner. The favours have nothing to do with our wedding colours, but I’m so excited to see a colourful, pretty pile of them all at the reception! They’re going to be on a table or something with a sign something along the lines of: Thanks for spreading the love, take some jam to preserve the memories! Now the next decision is: do I have them in piles by flavour, or one big multicolour pile? When I tell people I make my own jam, I get varied reactions. “My grandma used to do that!” “That sounds so hard!” “Won’t you poison yourself?” and of course, “Can I have some?” The answer to the last one is generally yes, depending how much I’ve got, and how much I’m hoarding it. Once I tasted the plum sauce I made last year, I turned into Gollum and didn’t let a single jar out of my sight! 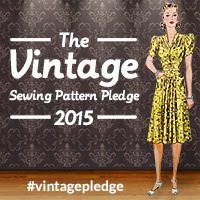 I’m going to do an extra-large batch this year, but I digress. 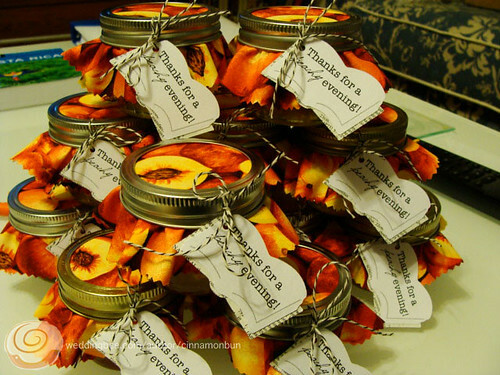 I want to encourage any bride-to-be, waiting-to-be-engaged person, heck, the whole world to make their own preserves. 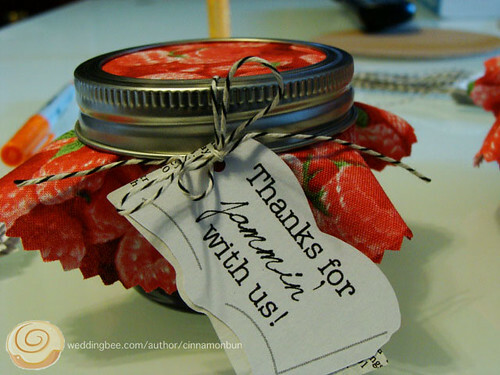 I’m just picking on you wedding-y types, because A) this is a wedding blog, and B) jam seems to be a hot favour! The process isn’t scary (follow the recipe, and you won’t poison people) or dangerous (if learn from my mistakes, and always wear long sleeves. Hot sugar spatters hurt!) and is a lot of fun. I learned a lot from my mum who worked so hard every summer, canning up all the produce our garden produced. It was a lot! 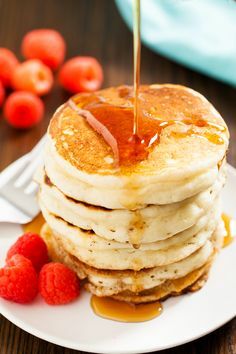 This one is great, because you don’t end up with gallons of jam. I love making it, but Cinnamon Buns and I don’t actually eat much jam ourselves. I just enjoy the process! This is the book with the plum sauce recipe that anyone with access to plums needs to try. I got this one from Cinnamon Buns for Christmas, and oh my goodness. This is the book everyone needs to read. Read the intro! Read it all!! This woman could be me. She shares my same dislike of using pectin – this is the first book I found that agrees with me about that. Mum never used pectin, why should I? Jam should have two ingredients: fruit and sugar. Three if you include water! 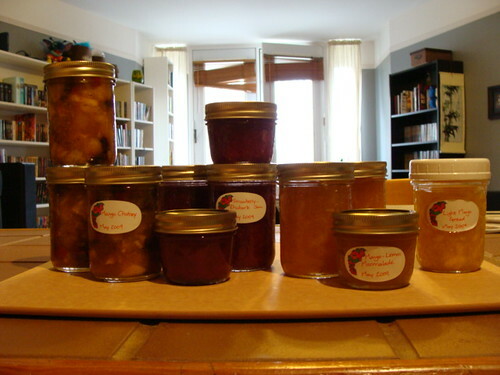 Besides, recipes with pectin make way more jam out of the same amount of fruit. Economical, but you’re basically diluting the taste! That little soap box-part of me aside, the recipes are all delicious-sounding, arranged by season, and it is just a beautiful book. I can’t wait to get a few authentic jam spatters on it! 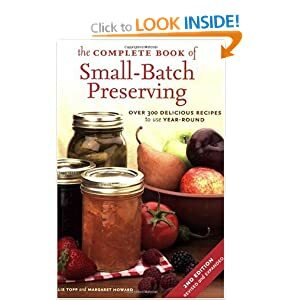 Small-Batch Preserving has helped me a lot in the past few years, but Liana Krissoff seems to be my canning-sister-separated-at-birth, if her book is anything to go by. Go buy! We’ll need these skills when ye greate apocalypse comes. 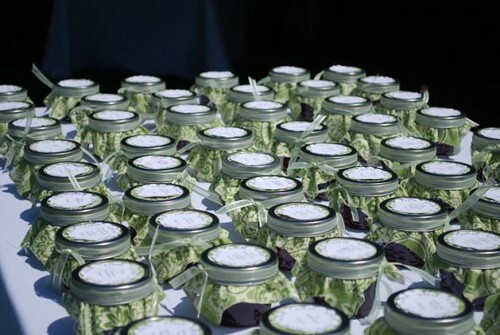 😉 Or, if you just want cute, tasty favours for your wedding. Do you can? Do you have a favourite book? Recommend it! 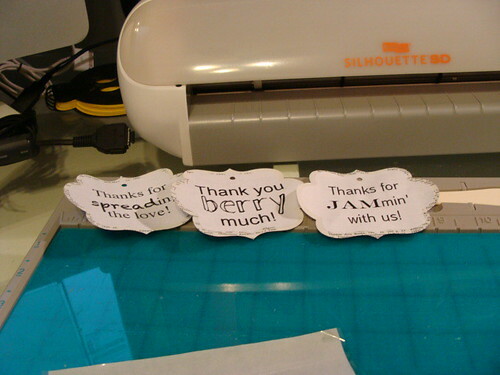 So we’ve talked about what is going to be on our jam favour labels. Time to show you a few test labels I made! I’m all about testing and prototypes, and I’m so glad I didn’t dive into this with my first idea! You’ll see why soon. I bought something I’d been coveting for a while back on Black Friday. I’ve never really made scrapbook layouts like Miss Lox does, but I have always been a huge fan of scrapbook supplies. I finally gave myself an excuse to start buying them by making greeting cards. You should see my stash! No wait, you shouldn’t, it’s a mess. 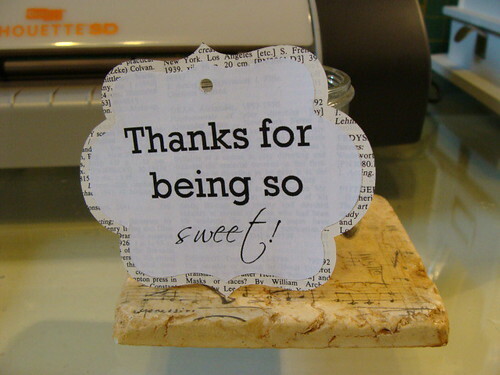 Anyway, I’d been wanting a Cricut for a long time until I heard a card-making blog mention the Silhouette SD. It is similar to the Cricut in that it is a digital cutting machine, but unlike the Cricut, you don’t need cartridges to get new shapes! It comes with software, and once you’ve installed it you can use any font on your computer. They also sell shapes for about $0.99 in the Silhouette online store, which I think is way more convenient than any cartridge. So on Black Friday I found the best deal I could, and the Silhouette SD became mine. I’ve tested it out a few times, but this is the first project I’ve started. The other great thing about the Silhouette is that you can set things to print or cut. It isn’t a printer, you print on your regular printer then feed it in the Silhouette to cut. The Silhouette software prints registration marks so the machine can find where it is on the page and cut everything perfectly. 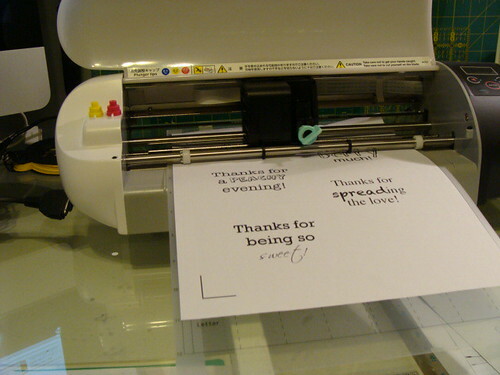 This feature is great for getting text on shaped pieces of paper! I took all the following photos of the process myself. 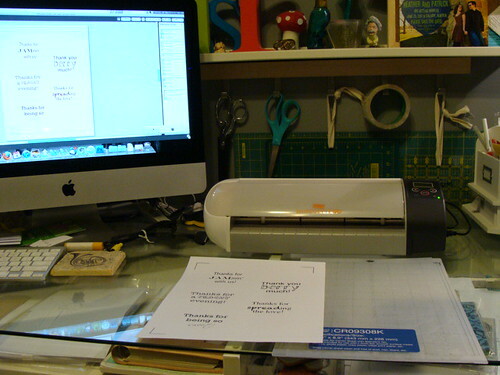 The scene: My compter/crafting desk, with the Silhouette in the centre. Here you can see the paper I printed the words on. You can see 3 L shapes on the corners of the paper – these are the registration marks. 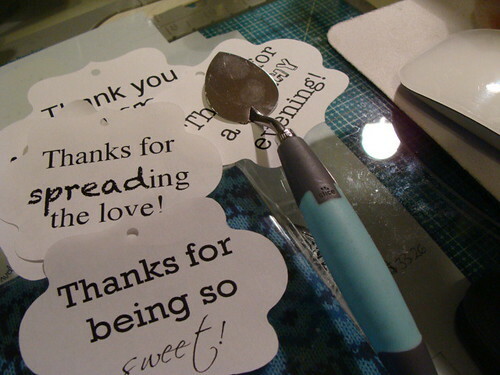 The transparent thing to the right of the cardstock is the cutting mat. It is sticky, and you stick your paper to it before it goes through the machine. There are different ones for paper and for cardstock. Do not stick paper to the cardstock one – the adhesive is so strong it rips printer paper to shreds when you try to take it off (ask me how I know!). Paper going through the cutting machine. Each of these labels is a combination of 2 different fonts – I wanted to test out a few to see what Cinnamon Buns and I liked best. I made a small mistake when setting up the document – I sized up a copy of the shape so I would have a mat, but I forgot to take the mats out of that document before sending through the cutter. That just meant it cut a separate ‘border’ that it didn’t need to, but otherwise it didn’t affect anything. The Silhouette doesn’t come with it, but I totally recommend buying a spatula by Cricut or Slice (that’s the brand of mine). They’re made for other similar machines, and really help for getting the paper off the sticky mats without bending/ripping/curling. 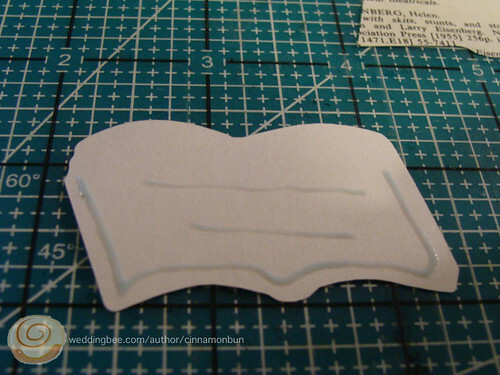 I cut the larger shape out of a page from a theatre reference book I bought from the library for $0.50. **No great works of literature were harmed in this project. Then I stuck the label to the mat, and got these! I used gluestick on some, and my Xyron on the others. 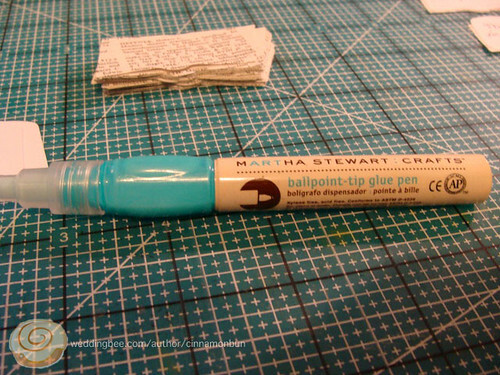 The Xyron ones turned out way better, but it was also a really old gluestick. Awesome! Punny labels! When Cinnamon Buns came home from work, I showed him. He said ‘they’re a little big….’. I said ‘Really?’ and then CB went and got me a jam jar from the kitchen. Yup, bigger than the jam jar (you can just see the rim behind the upper right of the label). We also realized that we should use cardstock instead of printer paper, so you can’t read the book text through the label. I went into my library of shapes to show CB what other scrolly labels shapes I had, and he pointed at a shape I hadn’t even considered and asked if I could try that one. He had pointed out an open book shape! Smarty-pants! Etc etc etc, same process, and we had this! Not only is it smaller than the jam jar, it is book-shaped! We also picked our favourite fonts out of the ones I’d used: American Typewriter and Ahnberg. I’m not too worried about matching fonts with our invites, but will try to keep venue stuff to the same ones for continuity. 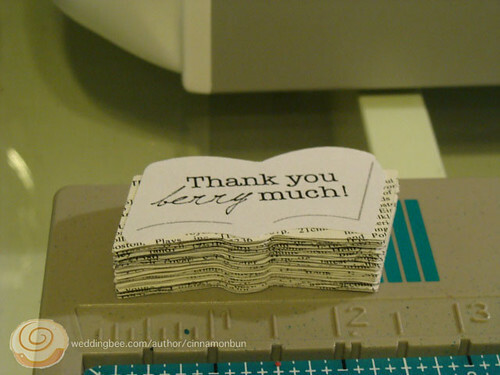 An awesome tool, and friend to scrapbookers and paper crafters the world around. 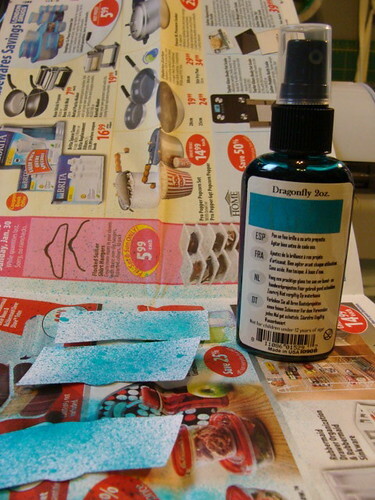 It is basically sparkly spray ink that comes in tons of colours. You bet I have some in our wedding colours! Again, this isn’t what we’re planning on doing for the actual favours, I just needed to make my white test-covers a different colour, and it was either this or scribbling with a Sharpie. Labels ranging from 2.25″ to 3″ across. 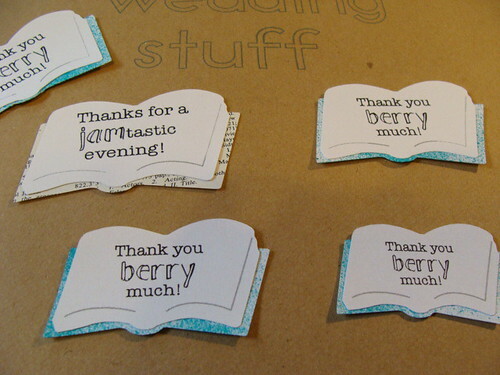 After seeing these, I’m toying with the idea of Glimmer Mist-ing the book paper, but I’m not sure about that yet. I tucked these all into the jam jar so they’re handy to show Cinnamon Buns when he comes home. I think the tiniest is a bit too tiny, but they don’t need to be as big as the biggest. I guess I’m with Goldilocks on this one. 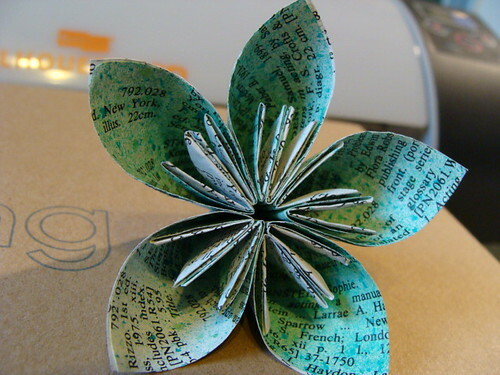 I used both Dragonfly and Lilypad Glimmer Mist and made a Kusudama flower. Do you take a few runs at your craft projects, or jump in with both feet and cut out 60 of the first idea you had? 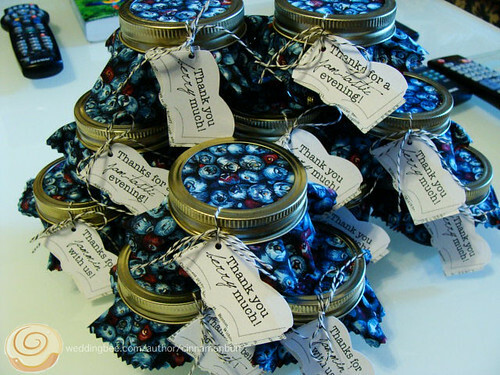 Wedding favours! Cinnamum fulfilled her part of the bargain – mixed berry, blackberry, and raspberry jam. Also in that tower-o-jam are the blueberry and the peach that I made over the summer. The only thing left is the strawberry jam, which will have to wait until strawberry season starts up again. Originally, I wanted to do the first one because I felt it would be easier than fiddling with elastic and string, but now the adorable-ness of the fabric and string is getting to me! All the best jokes in the Cinnamon Bun household are greeted by groans. We try to never miss an opportunity, and congratulate each other when we get particularly good ones. 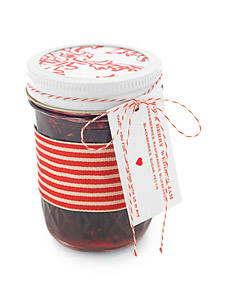 I want to come up with an assortment of short-but-sweet jam puns that will fit onto a little cardstock circle. They don’t particularly need to have anything to do with the flavour of the jam, they just need to be groaners. I want to make a bunch of them, so there are lots of different ones to read in the favour display. When I told Cinnamon Buns that I wanted to make punny labels for our jam, he said “I like you. I’m keeping you!” so I know he is up to the challenge. Thanks for jammin’ with us! Thanks for a peachy evening! Thanks for helping us seal the deal! Thanks for a jamtastic evening! On the labels, I want to make the pun word stand out a little, either by bolding or highlighting in some other way. Obviously, the berry and the peach ones would need to be attached to the appropriate jams. I don’t think ‘sticky’ really comes through in the ‘sticking with us’ one, so that might be out. I know there is something we can do with the word ‘toast’, but my brain is just not computing at the moment. And of course, I’ll need to come up with something witty for a sign to go nearby, so people know they’re meant to take one! I started making wedding favours in July. Yes, for my June 2011 wedding. We (and by ‘we’ and mean Cinnamum and I – sorry Mr. Cinnamon Buns!) decided on little 125mL jars of homemade jam for favours – Cinnamum is actually making most of them. Mum and dad live on the coast, where it is nice and temperate and wet, so they grow strawberries and raspberries, rhubarb, a smattering of blueberries, and blackberries are considered a weed. Mum is taking care of all the jams except for blueberry and peach – those were left to me because mum is more comfortable with the other berries. Plus, I wanted to at least make a few of the favours! It is important to me to use in-season fruit, so I got right on the blueberry jam, and waited until September to make the peach jam. I bought a 20-lb box of organic peaches at the farmers market, so Cinnamans and I ate a lot of peachy things for a while. Mum has made everything except the strawberry, which she will make with the first strawberry crop of 2011 – her strawberries are best in June, so when we made our decision mid-July, it was a bit late. I had never had store-bought jam until I moved out of my parents house (and I didn’t move out until I was 21 and had finished university! 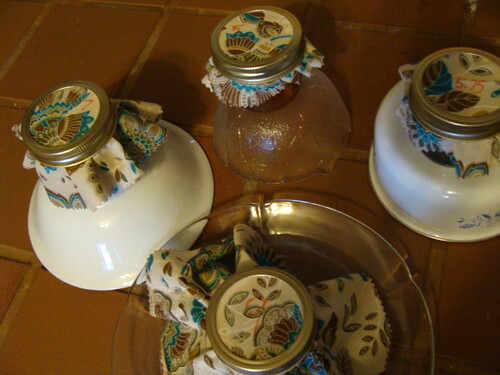 ), and I started canning my own after a year or two of storebought goo. I wouldn’t say mum particularly taught me to make jam, there was no ‘and now we have a jam-making lesson’, but when you grow up with that much canning being done, you sort of learn by osmosis. 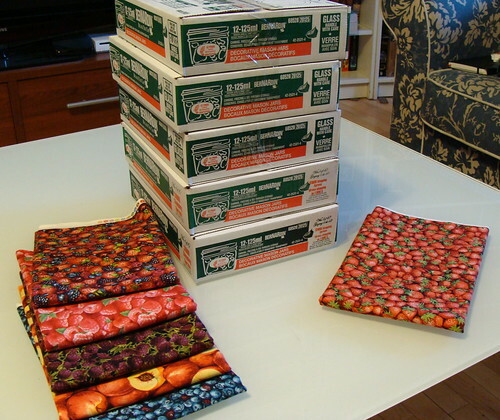 We had abundant strawberry and raspberry patches, along with a plum tree and multiple apple trees where I grew up, so there was a lot to can. 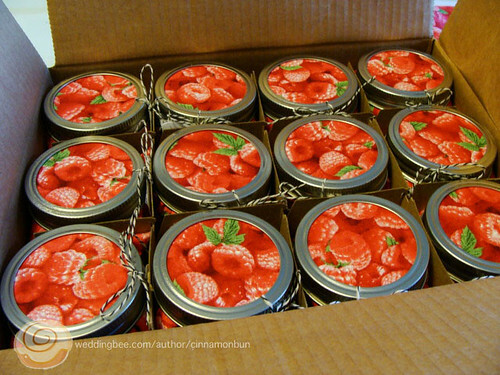 Some of my previous canning efforts, including my favourite ever: Strawberry-Rhubarb Jam. 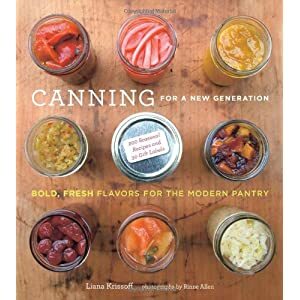 This history of canning makes the favours feel especially ‘authentic’ to me. 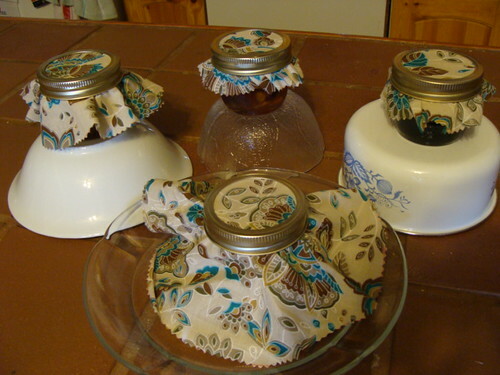 I know Martha Stewart has inspired many people to have jam favours, and I am in no way decrying the brides who learn to can just for favours: I think canning is something everyone should know how to do (along with bake their own bread, but I digress). I just love that we have jam favours, because it is very us. It also gives mum something to do for the wedding – I want to be able to include her, but because she doesn’t live here, we can’t actually do any wedding crafts together. 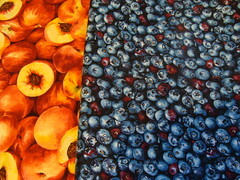 Cinnamum did come to visit for a weekend though, and we found some wonderful fabric at a quilting store (My Sewing Room) that is perfectly drawn prints of….. FRUIT! 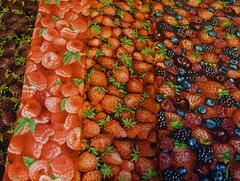 We bought fabric for each type of jam, so we don’t need to actually put the flavour on the label. Mum’s jams on the left, mine on the right. The orange sharpie was the only thing near to hand that I thought would be easy to see on my scrap fabric. It was that or a charcoal pencil, which I dismissed as being too messy. First, I tried one of our smaller dinner plates, because that’s what mum and I talked about in the quilting store when we were figuring out how much fabric to buy. 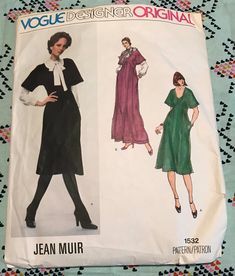 That’s that big mound of fabric in the front. There is a jam jar under there I swear! Then I traced a cereal bowl onto the fabric with orange sharpie and cut it out with pinking shears. Too big still. Little glass bowl was too little, but $0.50 garage sale metal food storage dish was perfect! Here’s a photo with the measurements written on the fabric. 5.75″ it is! I now have just one question… how does one get orange Sharpie off white bowls and glass plates?